Why Use a Wire? Are They Safe? When you need to send or receive money fast, a wire transfer might be the right tool for the job. Wire transfers are immediate, reliable, and safe (as long as you're not sending money to a thief). For significant transactions—like buying a home—wire transfers or cashier’s checks might be your only options. Why? The short answer is that the funds are available to the recipient more or less immediately. A wire transfer is an electronic transfer of money. 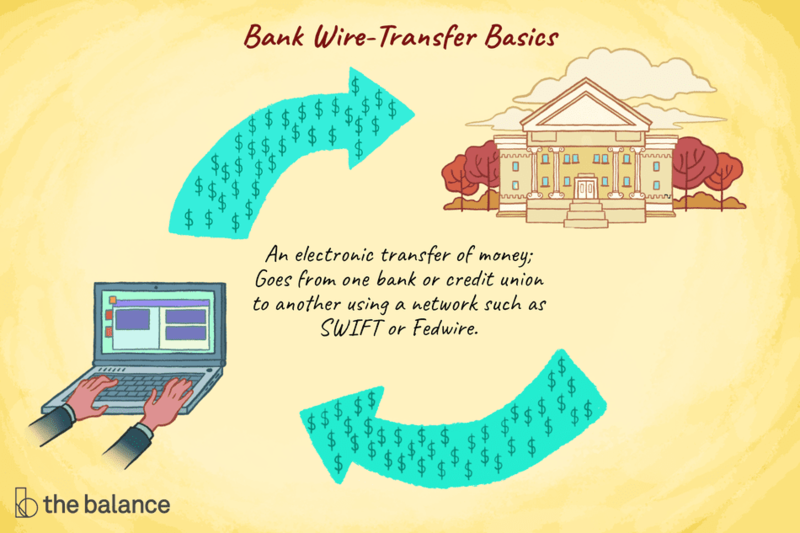 A traditional wire transfer goes from one bank or credit union to another using a network such as SWIFT or Fedwire. But the term wire transfer gets used for other types of transfers as well, so clarify the requirements if somebody asks for a wire transfer. Those other types of electronic transfers are described at the bottom of this page. But usually, if somebody asks for a “bank wire,” they want the traditional bank-to-bank transfer. Otherwise, a money transfer service or another type of electronic payment might be acceptable. Wire transfers are useful because the money moves within one or two days. Within the United States, same-day transfers are possible, and international transfers take an extra day or two. Cleared funds: Because the money moves quickly, the recipient should not have to wait for funds to clear before claiming or using the money. In other words, there is usually no hold placed on money received via wire transfer. For anybody selling merchandise or services, a wire transfer is safer than a check. Checks can bounce, and it can take several weeks (or more) to find out that a payment was bad. Processing time: Wires can be completed in one day, depending on how early you submit your request to send money. It may take several hours for the receiving bank to show the wire proceeds in the recipient’s account—even if the money is at that bank. A bank employee may just need to complete several tasks to make the funds available. If you’re in a hurry to use money you’ve received by wire, a few phone calls to the bank should do the trick. To wire money, just submit instructions to your bank. You’ll need to provide information about the recipient’s bank account, which you may need to request from the recipient—ask for “wire instructions.” To make the request with your bank, you may have to use a bank-provided form, but some banks let you complete the process online. For more details, see How to do a Bank Wire. To receive money by wire, you’ll need to provide your bank account information to the person or business sending money. Ask your bank for “incoming wire instructions” to be sure you use the correct numbers. Again, the money typically moves in one day, but it might take an extra day for the funds to appear in your account balance online (unless you call to have the process expedited, which might or might not be possible). Fees are often around $40 to send a wire, and $10 (or free) to receive a wire transfer. But if you use your credit card to fund a wire transfer, you’ll pay cash advance fees, a higher interest rate, and fees for the transfer itself. It’s best to send a wire directly from your checking account. The main risk with wire transfers is when you send money. With a wire transfer, money goes from one bank to another, and then to the recipient’s account. Inside of the United States, that means each party to a wire transfer needs a bank account. To open an account, federal regulations require that banks verify your identity (among other things) and ask for a physical address where you can be found. It is difficult to bank anonymously within the U.S., which limits thieves' ability to pull off a scam with a bank wire transfer. You can keep your identity from individuals and businesses to some degree, but law enforcement generally has the ability to find you. Even Swiss banks cooperate with U.S. law enforcement efforts. That said, scams involving wire transfers are not unheard of. Thieves only need to take control of somebody's bank account for a few days to get cash or send the money elsewhere. The main risk is that you send money, the thief withdraws cash (or wires it to a different account, possibly overseas), and you don't realize you've been scammed until it's too late to recover the funds. If somebody asks you to wire funds, think carefully about who you're sending to. Some transactions are especially risky: For example, if you wire money to an office that pays out the proceeds in cash (such as a retail "money transfer" shop in a strip mall, Western Union, or similar), it is harder to verify who got the money. Anybody with a fake ID can collect the cash. Home loans: Down payments and other wires to a title company are an attractive target for hackers. When buying a home, always verify where the money is supposed to be wired — especially if you get wire instructions by email. Hackers can alter emails (even from people you've been working with for several weeks) and instruct you to send money to the wrong place. To avoid problems, call the recipient to verify the wire instructions. Receiving funds: What about receiving a wire transfer—is that safe? For the most part, yes. Payments are more certain because banks only wire money out if the sender has the funds available. Once the money arrives, it should be yours for the taking within one business day (although exceptions may apply). What's more, it is very difficult for the sender to pull money back after it's been transferred. However, you need to make sure you received a real wire transfer. To do so, speak with somebody at your bank to find out if the funds have “cleared,” and discuss any concerns you have about the transaction. Some electronic payments can be reversed. Thieves like to take advantage of your confusion by promising to send a wire transfer but actually sending money using a different (reversible) method. The term wire transfer gets used for various types of electronic transfers. Those payments are typically not as instant or safe as bank wire transfers, as described above. In fact, almost all payments are electronic these days (even checks get digitized). Money Transfer services: Western Union money transfers and MoneyGram are sometimes called “wires” and some of those transfers are more or less instant. The sender can walk into a retail location with cash, and the recipient can walk out of another outlet with money in just a few minutes. However, if you fund those transfers from your bank account, the process will take at least several days. And if you use your credit card for a money transfer, you’ll pay extra fees. ACH transfers: Automated clearing house (ACH) transfers are also different. The money moves from bank to bank, but the transfer takes several days, and the payee won’t know for sure if the funds will arrive. ACH payments can be reversed, but only in limited circumstances. Apps and P2P payment tools: Several payment tools allow you to send money by tapping into your bank account indirectly. Venmo, PayPal, Square Cash, and others complete electronic transfers for you, but they probably aren’t considered “wires.” Be sure to check with those service providers on any risks you might be taking (especially if you pay somebody you don’t know). These services are typically easy and inexpensive. But each tool has strengths and weaknesses, so learn about the options and find out what works best for anybody you’re exchanging money with.